The Handmaids , most notably portrayed by Elisabeth Moss (Offred) and Alexis Bledel (Ofglen) are a class of women in the Republic of Gilead. They are the most important - but also the most oppressed - class of women in Gilead, as they are tasked with breeding and thus supplying Gilead with more children. 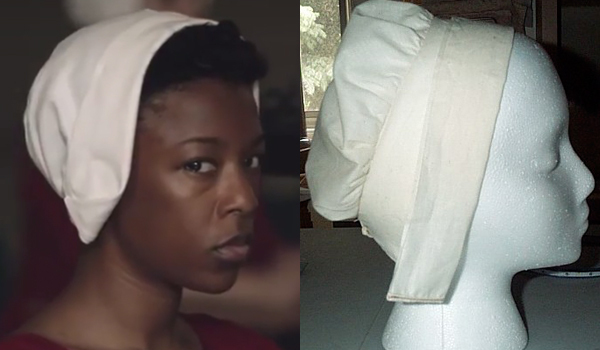 The coif that handmaids wear in The Handmaid's Tale is a Elizabethan inspired white coif . It is custom made exclusively for the show by costume designer Ane Crabtee. In any case, don't forget to fold the band just like in the show ! 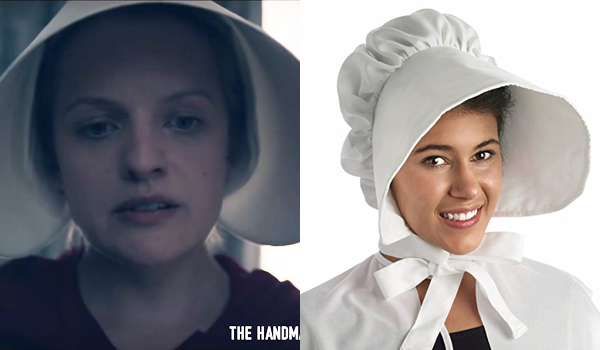 The bonnet that handmaids wear in The Handmaid's Tale is an oversized puritan bonnet. This one is very similar, to perfect the look you could also get rid of the laces. 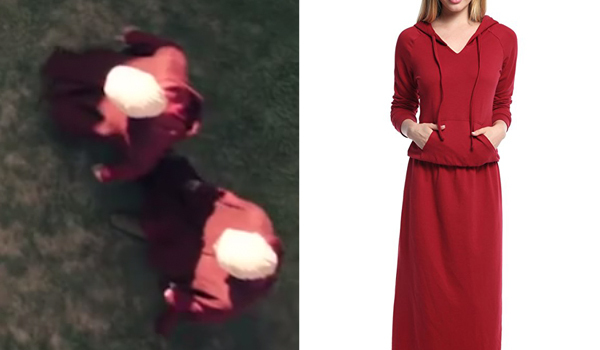 The dress that handmaids wear in The Handmaid's Tale is a sort of revisited nun robe. It is deep red, symbolizing fertility, full length, with long sleeves and comes with a hood. I used to sew for a small Co that made the costumes for Historic Jamestown. The material used to make the coal scoop bonnet is the same very stiff cotton used for making Nurse’s Caps. Any Idea for locating a company that still imports it? Obviously somebody does, because the show’s costume shop found it. I make bonnets for our group in Colorado Springs. For a pattern, I found a free pattern online for the coif, and I used that pattern for the back portion, then I modified the front portion, keeping the curve that joined the back, but enlarging the bill to the correct size. I used an inexpensive white cotton/polyester blend, stiffening it with two layers of the heaviest fusible interfacing. I’ve made about 30 bonnets for our protest group, at a cost of about $5 apiece. The most time-consuming part of the process is getting the interfacing ironed onto the fabric smoothly. One bonnet takes me about 4 hours, and is not difficult at all to sew. I have found that keeping most of the gathering at the bottom of the “bag” back portion, and having almost no gathers at the top of the “bag” portion gives the most authentic look. I’d be happy to communicate with anyone who needs advice on bonnet construction. For anyone who sews, I believe that this project is doable. Hi Sally! We’re trying to organize to make costumes over in Portland, Oregon! Any advice/guidance you might offer would be most appreciated! Hi, Sally, I’m an experienced sewer and I would love the link to the free coif pattern and any pattern you made for the bill. I’m making my own costume with the intent to go to an event near me when one is created. Thank you for your time. I don’t sew, at all, not even a button! I would love to buy one of your bonnets. Please please please do a How To with pics at different important steps or a YouTube video! You will be a life (and time) saver for many who want to do this! Sally, can I buy one from you? I haven’t sewed since Home Ec in 1995!! Simplicity pattern 3723 has both the under cap and the “wings” if you don’t fold the brim down. You do have to cut the brim larger. I am not convinced that you need any sort of special dress if you just make the cape. Has anyone heard of a protest around New Orleans?